For many latinos and Christians January 6 (Epiphany) is the day in which we commemorate the Three Wise Men (Magi) visiting the baby Jesus and presenting him with gifts of gold, frankincense & myrrh. I grew up in a Puerto Rican home, where we celebrated this by leaving a shoe box filled with grass under our bed on the night of the 5th. The Reyes would visit us at dawn and leave a small gift behind in the shoe box. Now in it's 3rd year at the Disneyland Resort, the Three Kings Day Celebration has really grown in size. This year it was moved from its 2013 location (Big Thunder Ranch Jamboree in Frontierland inside Disneyland park) to Paradise Garden inside California Adventure. As the grand finale of the "Disney: ¡Viva Navidad!" celebration, this event ran from January 3rd - January 6th 2014. An area was designated as the crafts and face painting area for kids. The Cast Members were wearing very cute outfits, and the decorations throughout the area were bright and fun. Lots of kids stood in line to get their faces painted. The meals and dessert treats available all looked and smelled really good. It was hard to decide what to eat, but I finally decided on buñelos. So good! There was variety of merchandise available as well. 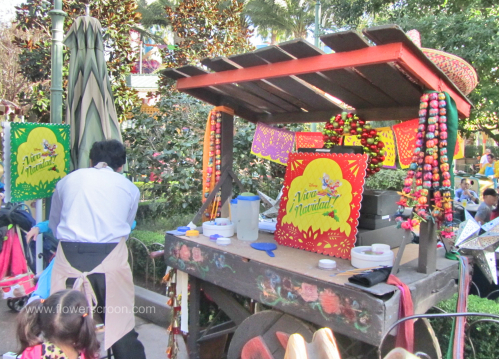 Most of the items were themed with the Three Caballeros, while others were handmade, unbranded goods. Really nice selection. Mariachi groups performed on the stage throughout the day. Some of the songs were classics I remember from my childhood and others were traditional Christmas songs. Next up: character photos! The Three Caballeros, Mickey, Minnie & Goofy were all on-hand for photos. The Three Caballeros and I. What an awesome photo opportunity! They were so much fun to watch dance and goof around with each other. I loved the change of venue and really enjoyed the accompanying ¡Viva Navidad! celebration this year. From the Street Party to the full menu of food, I think Disney did a great job of capturing the spirit of the holidays for latinos and others alike.